In my ongoing quest to learn to turn and, to a lesser extent, shrink my mountain of offcuts I present the next beginner project that I have tackled. The Honey Dipper. 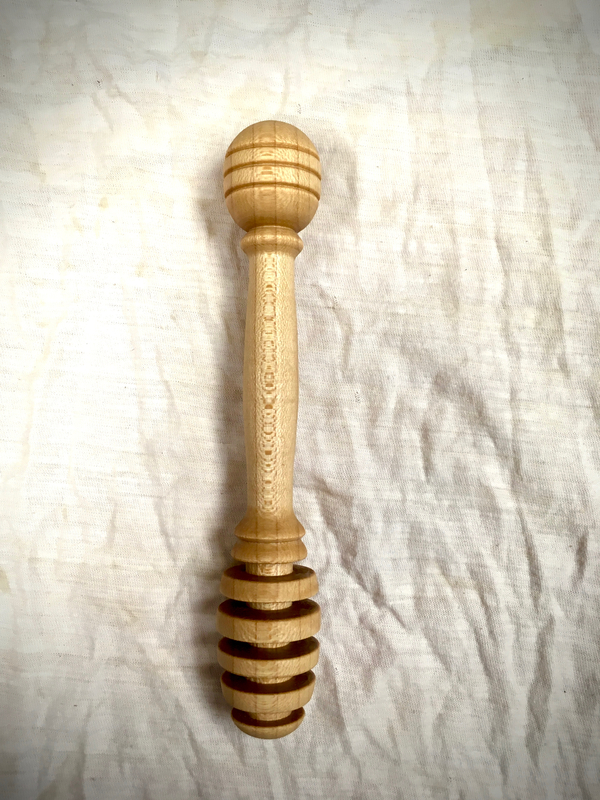 There is not much to say about the honey dipper, the name pretty well sums it up. It is another simple lathe project that lends itself to beginner success. There is ample opportunity for practice with basic shaping and working with the parting tool. The honey dipper can be any shape or size that your imagination can contrive or available material will support. However, I thought I should at least set forth a goal. Part of the skill building for me is to develope the ability to execute whatevere desired shape and size that I want. 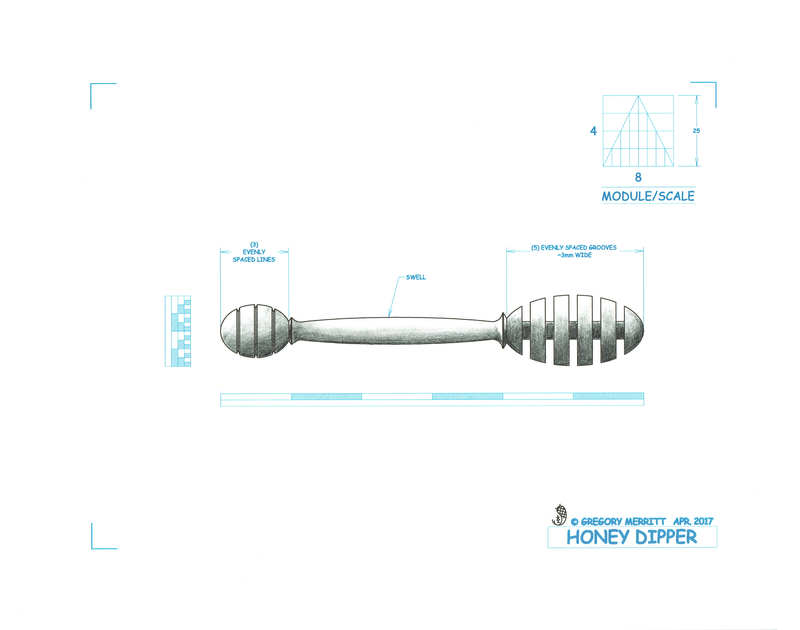 To that end, I worked up a design drawing for a simple honey dipper. I’m not going to show photos of the progression. What I will show are the first two honey dippers that I have turned on the lathe. The first one is the prototype prior to the design drawing. Here is my first attempt at matching the design drawing. As you can see, its not an exacting execution. It is, however, a perfectly acceptable and functional honey dipper. I’ll keep trying. This is one of those quick 15-20 minute projects that can be done whenever I just want a few minutes in the shop. I need to find a basket or build a box to start collecting these type of projects in. I think they will come in handy as gifts. Anyway, there you go. Another simple beginner project for those of us just starting out and possibly a fun quick project for you experienced turners. This entry was posted in Honey Dipper, Spring Pole Lathe and tagged Honey Dipper, Spring Pole Lathe, wood turning. Bookmark the permalink. Nice one, Greg. Looks like your learning curve has come and gone. Very smooth and even curves. I keep plugging away at it. I have a lot to learn, but I’m having a blast. Yep that was my first project when I was learning to turn, just make sure you use food safe finishes. BLO isn’t. It seems to be the ubiquitous beginner project. These first two received walnut oil, but I may switch to something else if I start giving them away. Too many folks with nut allergies these days. After considering allergies and some research I’ve been using ‘home boiled’ linseed oil (the vegetable cooking one) on wooden spoons and shopping boards and getting good feedback from several people. At this time it’s my favourite and I’ve tried almond, peanut, colza, sun flower and olive oil (all the varieties of olive oil) ! I typically use the same Tried & True finish I use on everything else for kitchenware. 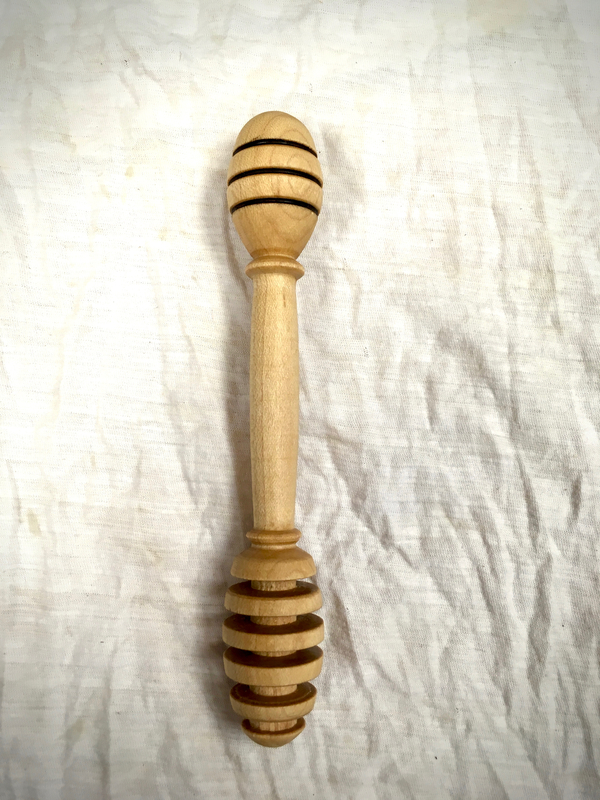 It is a mixture of food safe linseed oil and beeswax, but it is thick stuff and tough to get into the grooves of the honey dipper. I may try heating it up.